The Denver RTD TAMP is available here. 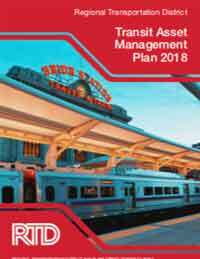 This Transit Asset Management Plan, produced by Denver Regional Transportation District (RTD) is a formal report that meets the FTA TAM requirements under MAP-21. It summarizes the principles that RTD uses to make asset decisions that are aligned with Agency priorities, its asset inventory and condition, the proposed capital investment plan for 2018-2023, and how the plan will be evaluated for continuous improvement. Additionally, the RTD has decided to move beyond the FTA's minimum requirements for Asset Management, and committed to implementing established international good practice in the form of ISO 55000 certification.